SKU: N/A. Categories: Leather Jacket, Women. 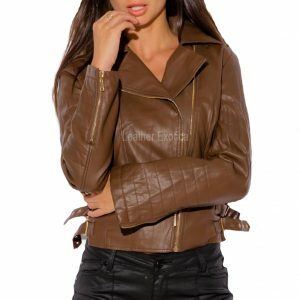 In today’s Fashion world “Leather Jacket” is very much in trend. They always look stylish and fashionable. Leather jackets have the potential to enhance your personality; it will make you look classier. Most of the Celebrities and rock stars wear them to stand-out and put forth a grungy style statement. This Valentine women biker leather jacket is one of its which will give you trendier look that you want. The color combination of this jacket is very nice that makes it elegant and stylish. Design with stand collar and long sleeves. 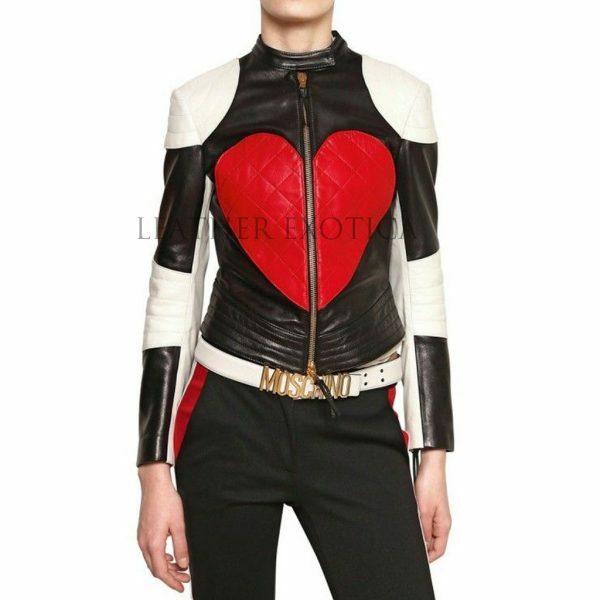 This is short length leather jacket and it has red heart shape patch detail at the front side which looks really awesome on it. It also has a front exposed zipper closure and fully lined. Get it right now and get the coolest celebrity style look.